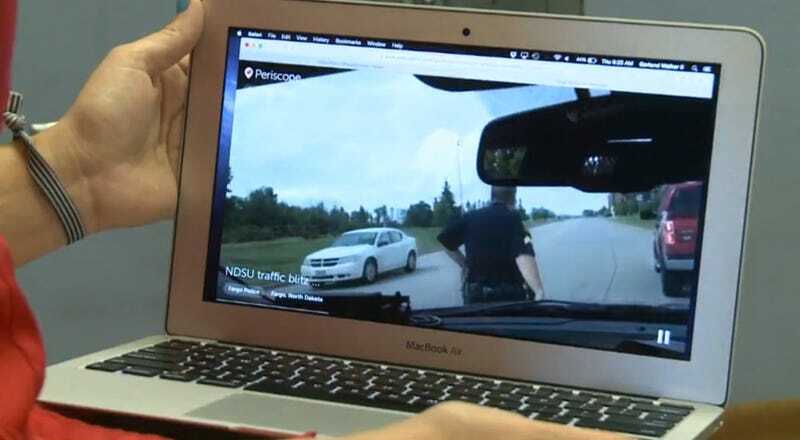 Police in Fargo, North Dakota have started livestreaming traffic stops via Periscope in an experiment for all the world to see. And so far, it’s been an embarrassing failure. But the Fargo PD doesn’t see it that way. “We just learned about the app a couple of nights ago so we thought, ‘let’s just get our feet wet a little bit, try it out’,” Fargo Police Department spokesperson Jessica Schindeldecker told local news station KLVY. “It’s just another medium to connect and engage with our community,” Schindeldecker said. But according to her description of what happened this past Wednesday, it all sounds like a confusing mess. Their first broadcast had to be cut short because the driver was asked to exit the vehicle. “Obviously, if you watched the first broadcast we did [...] the individual had to get out of the vehicle per Sergeant Vincent’s commands... or his request to get out of the vehicle, so I did make a very good attempt to get that person out of there and not get that license plate on there and just to get that privacy,” Schindeldecker said. Sure. Sounds like a great plan from people tasked with public safety. Let’s just see how it goes! “It’s very voyeuristic. It’s almost kinda weird,” the newscaster said in what qualifies in the Upper Midwest as brutally forceful language. Despite their boondoggle of a first stop, they tried two more during the day. The Fargo PD say that they’ll continue using social media in an effort to connect with the community. Which, of course, involves livestreaming the community’s traffic stops using any technology they learned about the day before.